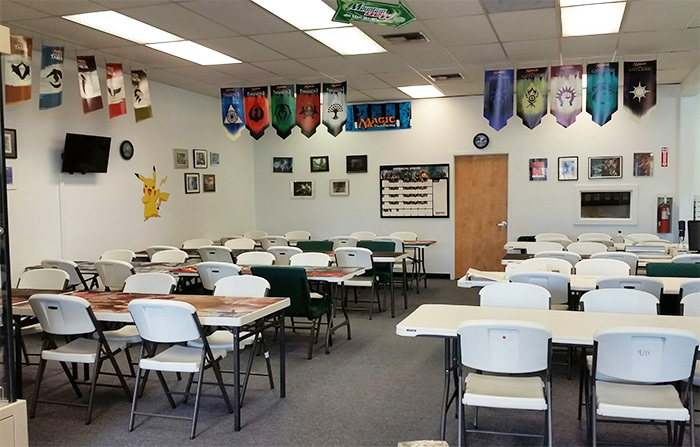 The Relentless Dragon, a game store in Nashua, New Hampshire, specializes in collectible/trading card games like Magic: the Gathering, and Pokémon; non-collectible card games like Dominion, Star Realms, and Munchkin; role-playing games like Dungeons & Dragons; miniature games like X-Wing, Armada, and Games Workshop’s Warhammer 40K; and table-top/board games such as Catan (formerly Settlers of Catan), Ticket to Ride, and Carcassonne. We provide a large playing area of tables and chairs which can accommodate 80 players. This space is free to use for game-related purposes which are consistent with our vision. Reservations are not required, though if you’re planning a large gathering, they are recommended. Tournaments for various games are held on a regular basis. These tournaments include both manufacturer-sponsored and non-sponsored events. Magic War of the Spark prerelease weekend is April 27th through 28th. Featuring events in both the Nashua and Londonderry stores! Join us for the exciting prerelease of Unbroken Bonds, the latest set of Pokemon Sun & Moon. Join the Relentless Dragon and the Muse’s Touch Miniature Painting for an afternoon of hobby fun. This is an open event for hobbyists of all skill levels–from those just getting started painting miniatures to experts looking to spend a relaxing afternoon with like-minded hobbyists. Join us for a double-header weekend of Pokemon League Cups in both the Londonderry and Nashua stores! Join us for two Pokemon League Challenges on February 16th! At 11:00 a.m. in our Londonderry store and at 5:00 p.m. in our Nashua store. Registration begins at 10:00 a.m. and 4:00 p.m. respectively. Admission is $5 to each event.